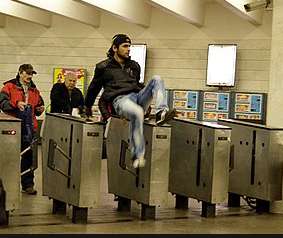 climb over the barriers to avoid paying for a ticket. They do so, he says, with impunity, in full view of the public and staff. No one stops them or says anything to them; it isn’t worth the trouble. They are pleased with what they have done, an expression of the power of the powerless. would have turned angry if anyone had said anything to them, as if their human rights were being infringed.